Welcome to Millennial Money’s “Money Review Series“. 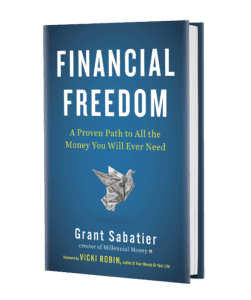 Each week, we review a product or service aimed to help you make more, save more, or grow money through investing. Our goal is to provide you with an honest review to help you achieve these goals. 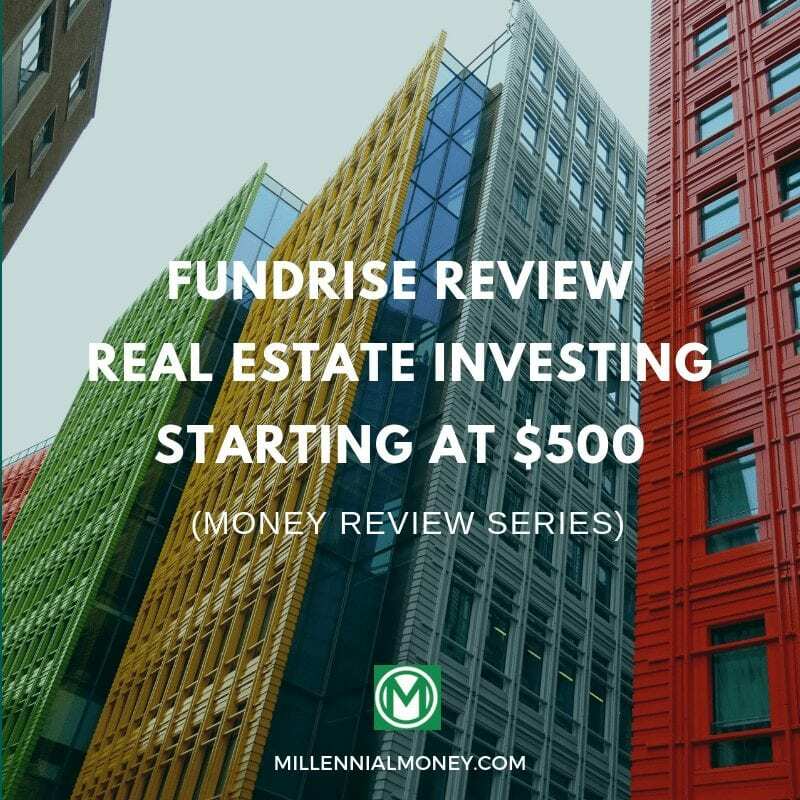 Today, we review the crowdfunding real estate investment platform Fundrise. This is the most legit Fundrise review you will find on the internet. 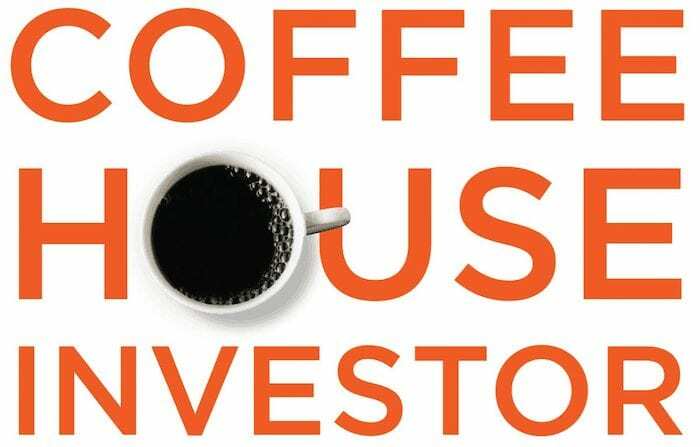 Real Estate investing is one of the best alternative investment classes. Not only does it let you diversify your investment portfolio, but it’s proven to have returns that don’t necessarily correlate with the stock market. But not everyone has the money to front for an investment property, and even more don’t have the time to upkeep a rental property, find tenants, and—God forbid—have to deal with tenants that don’t pay or trash the property. Thankfully—you don’t have to have either in 2018. After the JOBS act was introduced in 2012, it made online real estate crowdfunding portals perfectly legal. This quickly spurred hundreds of different real estate portals, letting accredited (and in some cases, every day) investors to buy small pieces of many properties at once. In the beginning, we rarely saw these portals open to the everyday investor, so there was a sense of exclusivity in real estate investing. For those unaware, accredited investors must have an income of $200,000, and couples must have a combined income of $300,000. But nowadays, that’s all changing. A few real estate crowdfunding services have popped on the scene that doesn’t require accreditation and has small investment minimums but still offer premier investment opportunities to investors. Fundrise is a great example of this. The real estate crowdfunding service is one of the best in the industry and is one of the first that’s open to all investors—not just those meeting specific income requirements. In the article below, we’ll discuss why you might want to invest in Fundrise and give you our full review. Some of the team members on our site are active investors in the site, so we’ll use their experiences to guide this review. I consider myself fortunate; it’s harder to buy real estate today. The Housing and Economic Recovery Act of 2008 that established a tax credit for first-time homebuyers no longer exists. Real estate markets in high cost of living areas are extreme. House hacking is a great way to help build equity, however, it requires a large downpayment. Building up a real estate rental property portfolio is harder to do on your own. The reality is, many are struggling to buy a home. Saving up for a down payment is often the challenge. Luckily, you can increase your real estate investment exposure with the support of many others. 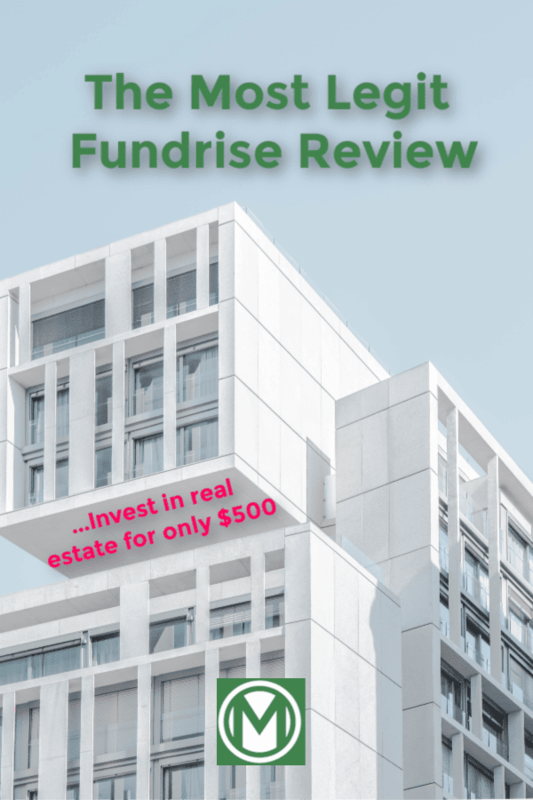 In this post, the real estate investment platform Fundrise is reviewed. Now there is a way to invest in real estate for as little as $500. Fundrise is a Washington D.C. based real estate investment portal. The portal launched in 2012 after receiving SEC approval and has quickly become one of the net’s best (and most well known) real estate crowdfunding portals. In addition, it’s still one of the only portals available to non-accredited investors. Fundrise is a little different than other real estate crowdfunding portals, though. On the portal, you can buy and sell eREITs—or, real estate investment funds—giving you a share of a real estate investment that’s generally income producing. Unfortunately, these shares cannot be publicly sold, making them hard to cash out. I was a little skeptical at first and only invested because Fundrise promises for a 90-day money back guarantee. Within the first 90 days, however, I was extremely satisfied with my portfolio return, low fees, and transparent practices. I decided to stick it out for the next 5 years! 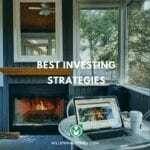 – Investing in real estate as part of your diversified portfolio can be a good idea. – It is possible to get higher returns in the private real estate markets than in the public REITs. – Allows for instant diversification, so you are not stuck with one property manager or building project. – Ability to capture the “liquidity premium.” Diversified away the single-property risk, and can hold illiquid assets that pay higher because they are illiquid. – Customer service is great. – The structure of the investment simplifies the messy taxation of these types of investments. – At 1% annually, fees are reasonable. – A Fundrise investment can be included within an IRA. – Investment if not liquid (1%-3% redemption fees, unless held for five years). – You have to wait at least 60 days before your redemption request will be considered. -There are income requirements for buying the shares. Fundrise has a second investment product too: eFunds. Instead of investing in single properties, eFunds pool money to buy commercial real estate or managing buildings, eFunds pool investor money to purchase land, build houses, and then sell them to buyers. Like eREITs, these are also hard to cash out in the short-term. Additionally, there are two types of eFunds on Fundrise: one based in Washington D.C. and another based in Los Angeles. These are focused on investing in urban areas frequented by millennials and hit by the housing crisis. How do you get your money when it’s time to cash out? You’re expected to hold the shares for at least five years, and you may be charged an early termination fee if you decide to exit early. 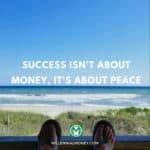 With this in mind, try your best to hold your shares for as long as possible. 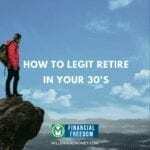 This gives you the most time for your investments to make gains and reduces the fees you need to pay Fundrise when it eventually comes time to sell your shares. This portfolio invests half of your money in the Income eREIT and half in the Growth eREIT, so your money is going directly into commercial real estate and long-term management projects. This also has the lowest minimum investment of all portfolios on Fundrise. Invests a quarter of your money into these REITs: East Coast, Heartland, West Coast, and Income. This gives you a ton of diversification and will protect you from losses if one region suddenly becomes undesirable. This is the most diversified portfolio on Fundrise. Balanced invests 20% of your money in the Income eREIT, 18.33% of your money in each of three eREITs (Heartland, East Coast, West Coast), 15% in the Los Angeles eFund, and 10% in the Growth eREIT. The long-term growth plan focuses heavily on eFunds. 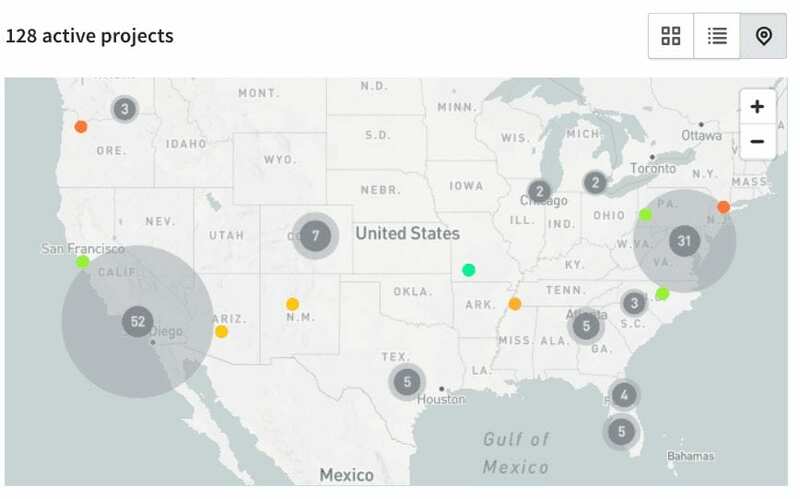 With this portfolio, Fundrise invests 20% of your money in the Growth eREIT, 20% in the Los Angeles eFund, 16.67% in three eREITs (Heartland, East Coast, West Coast), and 10% in the Washington DC eFund. You can open an IRA with Millennium Trust Company, and invest in any of the eREITs for a $75 annual fee per eREIT. This fee is paid directly to Millennium Trust and is capped at $200 per year. You can select asset types with varying risk measures. Check out my portfolio below. Once you pick a portfolio, investing in Fundrise is pretty simple. Unlike other real estate investing platforms, you’re not picking from a single property when you invest. This keeps your risk low, so you don’t have to worry about one deal going wrong ruining your entire portfolio. Additionally, beyond early exit fee, there are a few others you should be aware of too. The service fee charges a modest asset management fee of 0.85% and an advisory fee of 0.15%. Also keep in mind that if you redeem your shares within 90 days, you’re not charged anything additional. Do note that Fundrise can sell shares at a premium, so it’s always in your best interest hold shares for as long as possible. As stated earlier, this gives you the longest possible time to make gains and incurs the least interest possible. All in all, we highly recommend Fundrise to investors that want to diversify their portfolios, or to non-accredited investors that want to dive into the real estate crowdfunding space. I’ve been investing with Fundrise since March 2017. I put $3,000 into the Long-Term Growth Plan. Every quarter since Q2 of 2017, I’ve received a divided, which I reinvest. 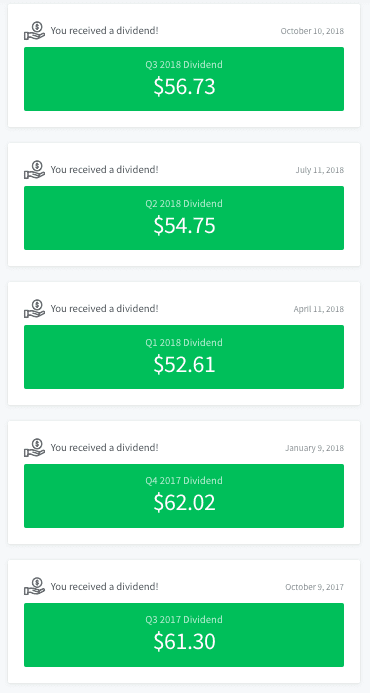 Below is a snapshot of my dividend returns. 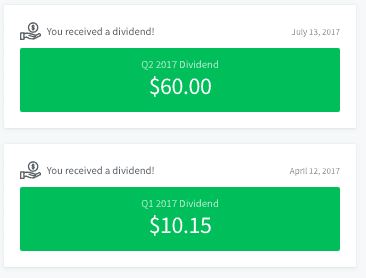 My $3,000 initial investment returned $357.56 in dividend growth in 19 months (6.3 quarters), or just over 7% annual return.